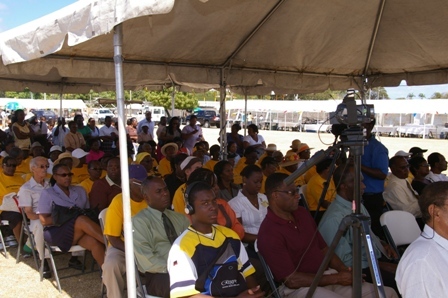 (CHARLESTOWN, NEVIS–Monday, March 28th, 2011) Premier of Nevis, Hon. 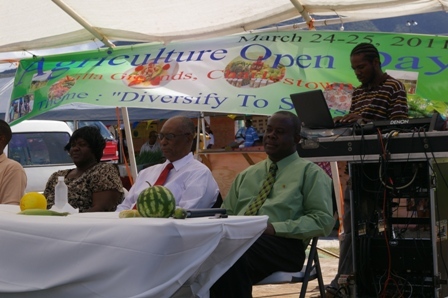 Joseph Parry said he was satisfied with the strides made in Agriculture on Nevis. He made the comment when he delivered remarks at the opening of the 17th annual Agriculture Open Day hosted by the Department of Agriculture on Thursday at the Villa Grounds in Charlestown. Hon. Joseph Parry said the Agriculture Sector had developed a plan to identify 10 locally produced items which would serve as an import substitute for the growth of Agriculture and success with that project had ranged from 22 to 100 percent. “I congratulate the Permanent Secretary, Dr. Kelvin Daley and the Department of Agriculture for delivering a plan to change the system of Agriculture by modernizing it in every way and the use of technology that are available to increase production on the island of Nevis,” commented the Premier. Regarding the growth of Agriculture on the island, the Premier stressed the importance of reaching out to farmers, diversification, adoption of new technologies by farmers and improvements in product marketing. He noted that the Abattoir has played a key role in the development of Agriculture and the provision of food in Nevis. The Premier said he was extremely pleased to see the Agro processing plant was in great use and that some 5000 produce passed through the plant for the benefit of the people of Nevis. He also thanked the Japanese Government for their investment in the Fisheries Department. According to the Hon. Joseph Parry, the Minister of Agriculture, Hon. Robelto Hector had outlined a number of upgrades slated for that Department in the areas of marketing and modernizing. “Our aim for the Fishing and Agriculture Department is to have lots of goods available for the people of Nevis and for the hotels on the island,” remarked Premier Parry.